I follow a red clay, dirt path behind Phoebe, a Community Health Volunteer, and as we walk together she tells me that she is soon to retire after almost 20 years of listening, understanding and helping her community. She shares parts of this long journey from children that have been cared for, families that have grown and challenges that have been overcome. Phoebe is inspiring and I am amazed by her strength, generosity and the kindness she uses to care for sick and vulnerable neighbors in her small village in Kenya, just outside of Kisumu city. She proudly carries a backpack displaying the Kenyan Ministry of Health’s logo as we walk down the path towards a cluster of homes. This was a new place to me, but to Phoebe, it’s her home. Born and raised in this village, she smiles warmly at everyone she encounters. They, in turn, smile and exchange greetings in the local language. It’s the warmest of welcomes and I’m grateful to be included. We conducted a week-long training in Kenya related to measuring success. A crucial part included walking with our partners in the places they work and meeting the people who participate in our programs. Phoebe was my gracious guide. The first house we walked into belonged to a young woman, a single mom of 22, who has been diagnosed with HIV and has two children. According to Phoebe, this is a common situation. At the next house, we met with a kind mother and vibrant, beautiful two-year-old who was very excited about our data collection instrument, a mobile tablet, and continued to press and play with it as we engaged in conversation. 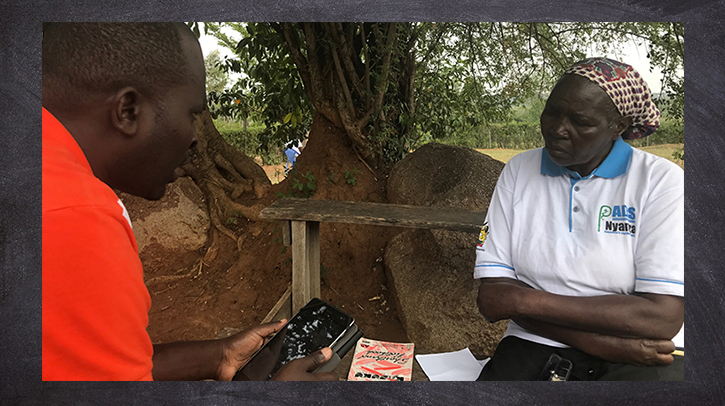 We had a chance to talk with many other people participating in the integrated health programs carried out by Anglican Development Services-Nyanza, Episcopal Relief & Development’s partner organization. These visits were a striking reminder of why our purpose there was so important. Our purpose in Kenya has a highly technical aspect. 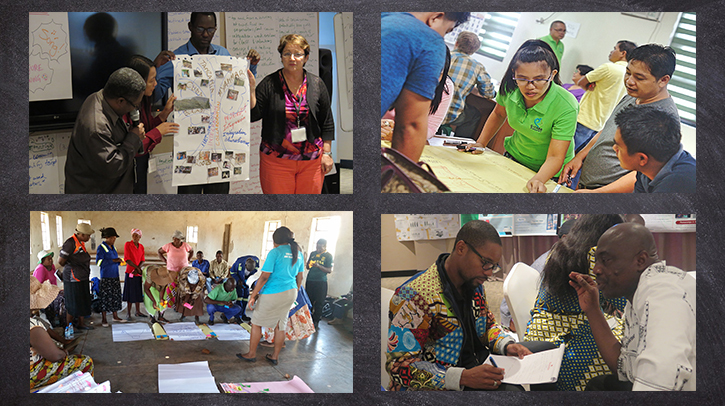 Episcopal Relief & Development is investing in an expansive approach to program Monitoring, Evaluation and Learning (MEL). Using standardized indicators for measurement across the global program, we are working with our program partners to capture detailed information at the family level to better understand what contributes to transformative change over time. We train our partner teams so they can gather this information using mobile technology across all the sectors in which we work, building on our strong partnerships and incredible volunteer network. And we expand on the data collection practices established during our flagship malaria program, Netsforlife®. It’s very exciting. Understanding and replicating cause and effect for the impact of the work that we do is a challenge in development. We know it can take many years to see significant change and it is difficult to measure progress especially in initiatives like behavior change in gender-based violence programs and building climate resilience in communities. We find, however, that our unique purview and strong partnerships at the grassroots level strongly position us to develop ways to measure progress in our programs. We find that this consistent evidence-based approach, in dialogue with communities, helps better inform our collective goals and aspirations to empower and support transformation. Before a project begins, people in the community and local project staff ask themselves, what is our vision for the future? Then, with Episcopal Relief & Development’s new “Global Indicator” approach, progress towards these goals can be assessed in practical, user-friendly ways and we can all learn in the process. What’s working can be expanded. What’s not going well can be addressed and projects improved. As time goes by, results can be affirmed, impact broadly shared and communities celebrate and discuss the evidence around their dreams becoming a reality. I was in Kenya to conduct a field test of the system. With that field test now completed, our team is ready to provide technical assistance to partners to roll out the new tools and indicators across 15 country partnerships. Once all of this work is completed, we hope to deepen our understanding of the change happening within our partner communities. We expect to see and understand the data-driven narrative more clearly so we can continue to share, learn, grow and improve. We’re excited for what's to come as we work with our partners to tell our stories to and with each other, reinforced by this evidence. We look forward to sharing those changes together with Phoebe and the 22-year-old mom of two, and with all our stakeholders and supporters around the world. Christina Irene is the Manager of Monitoring, Evaluation and Learning at Episcopal Relief & Development. Images: Top—Words read "Vision. Monitor. Evaluate. Learn." Episcopal Relief & Development has several programs in Kenya, including Agriculture, Micro-finance and Maternal & Child Health; Middle 1—Ambrose Orege, from Episcopal Relief & Development's Kenya partner organization, ADS—Nyanza, interviewing Community Health Volunteer Phoebe Nyandiko on health data; Middle 2—(top left, bottom right) Episcopal Relief & Development partners at the Charting Pathways to Integration and Impact conference, (top right) Episcopal Relief & Development's partner E-CARE held a visioning conference, (bottom left) Episcopal Relief & Development's partners in Zimbabwe work together at a Disaster Risk Reduction workshop.